Is there any meal where potatoes feel more at home than they do at Thanksgiving? There’s mashed potatoes, scalloped potatoes, sweet potato casserole, roasted potatoes (and roasted sweet potatoes! ), these are just some examples of the wonderful carby potato-ey things we can look forward to every Autumn. Now for Canadians, Thanksgiving is a mere 9 days away and it’s time to start thinking about the menu! This year I’m striving for simplicity. If all goes well, I’ll be spending October getting ready to move. This is both super exciting and super stressful because it means I get to spend the month doing things like packing and cleaning. Bleh. I see no reason to add making a big ol’ Thanksgiving feast to my growing list of to-do’s for the month. Plus, it’s only me, William and Lacey, so why bother making a fuss? This year I came up with this super easy, roasted Thanksgiving bowl inspired by the whole vegan lunch bowl idea. This Thanksgiving bowl is full of roasted veggies: Brussels sprouts, garlicky broccoli, sweet carrots and acorn squash, plus toasty pecans and lots of mashed potatoes. Top as you please with easy vegan gravy and crack open a can of cranberry sauce. Easy peasy Thanksgiving dinner. In case you were wondering, The Little Potato Company’s Baby Boomers are SO PERFECT for mashed potatoes. Oh my gosh. I might never go back to regular old russets for my mashed potatoes. For one, no peeling required, the skins are delicate enough to just mash the potatoes whole. Secondly, they require much less extra fat and liquid to create a nice fluffy mash. Bonus! Now all you need is a quick dessert like our Healthy Pumpkin Pie Parfait to finish off this simple vegan Thanksgiving dinner. Enjoy! 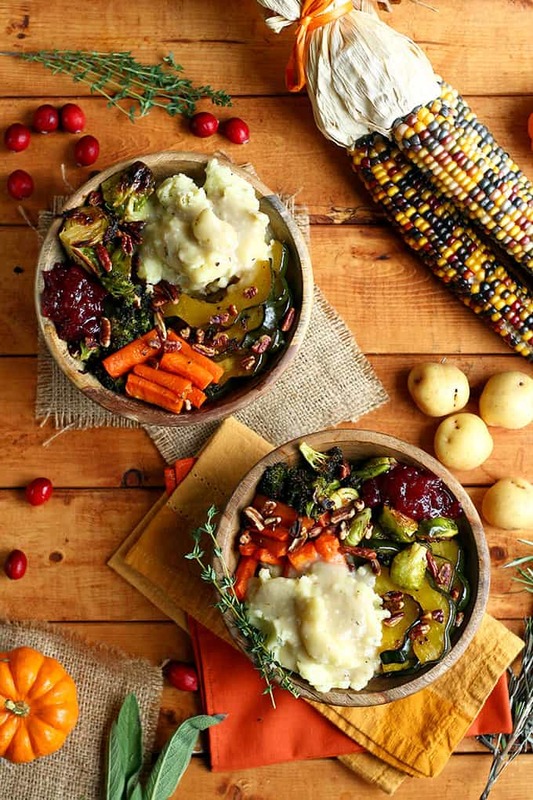 Easy peasy vegan Thanksgiving in a bowl! Roasted veggies, toasty pecans, mashed potatoes, and easy vegan gravy, all in 1 bowl and ready in less than 1 hour. Serves 2. Preheat oven to 425F. Prepare a nice BIG baking sheet lined with parchment paper. In a medium sized bowl, mix carrots and acorn squash with olive oil, brown sugar, salt and pepper. Spread both the carrots and the squash out on your baking sheet. Next, mix halved Brussels sprouts (same bowl!) with brown sugar, olive oil, salt and pepper, then spread them out on the same baking sheet. Finally, mix the broccoli with olive oil, garlic, salt, and pepper, making sure to really massage the garlic into the heads of the broccoli. Spread the broccoli on the baking sheet and pop everything in the oven. Bake for 20-25 minutes. About halfway through the cooking time, flip and stir everything on the baking sheet and sprinkle everything with 1/4 cup of chopped pecans, and top the squash with and extra sprinkle of brown sugar. While everything is baking you can boil your potatoes on one element and make the gravy on another. Boil the potatoes for 15 minutes (until fork tender) before mashing them with vegetable broth, vegan butter (like Earth Balance or another vegan margarine), salt, dried thyme and oregano. In a small saucepan heat vegan butter over medium heat. Once hot, whisk in the flour, salt, thyme, and oregano, and mix well. Cook for 1 minute before slowly whisking in the veggie broth (you may find you need a little more or less depending on your preferred consistency.) Simmer for 3-5 minutes until thick, adjusting the consistency with extra vegetable broth as needed. Serve with cranberry sauce. Top mashed potatoes and/or roasted veggies with gravy. Mmm…. I love your deliciously easy to prepare meals. When I run out of ideas, I check your recipes and always find something great to cook. Thanks for your inspirations to better living! I am definitely going to make this this weekend! Yay! I hope you love it Annie! Wow. This bowl looks amazing. These pictures are amazing. Your blog is amazing!!! Holy yum this looks so good! I don’t think I’ve ever clicked on a link so fast. Haha! I’m 100% making this soon. Thanks Peter! The nuts are pecans and they’re added to the roasting pan about halfway through the cooking time so they get nice and toasty! Doh! You’ve included pecans in the ingredients. I hadn’t realized until I wrote down my shopping list. Making this soon. Then again for Thanksgiving. Well now I’m so happy!! Looks like I’ve got Thanksgiving all sewed up!! I always wondered what to make for myself on Thanksgiving because my SO isn’t about to give up his meat. But I think this will work out just great! Thank you for posting this. Can’t wait to make it!! I know I will make this recipe often, it all looks incredible! Now I’m craving Brussels sprouts and squash. My husband and I loved your recipe! We made it two days in a row. The roasted veggies and potatoes were full of flavor. I’m so glad I didn’t skip the pecans or cranberry sauce, we really liked those extra additions! I just want to say that I have made this 4 times and it is my FAVORITE holiday meal! I love the simplicity – let everything roast while you make the potatoes and gravy. I *love* adding a bit of fried seitan (fried up in a bit of salt, thyme and onion powder – takes chicken-ey)so complete it but it’s perfect without the faux meat as well! Thank you SO much Annie! Tempeh sounds amazing in this bowl, too bad I haven’t found anywhere near me that sells it plain 🙁 That sounds too good! Please add me to your email list when you have new recipes to post. I work for a large school system and I’m always looking to expand our vegetarian and vegan options for our students. Done! You’ll just need to confirm the subscription by checking your email and following the instructions! I hope you have a great day! It was such a great idea for a meal! Made it for my husband and he fell in love. Now he’s requesting to have it every weekend. Awesome! So glad you and your husband enjoyed it. Thanks for commenting!! Really. Good. Food. A nice fall meal full of flavor and good-for-you stuff! Thanks so much for sharing the goodness. Does this only make enough for one bowl or will it make enough for two? Thanks! I’m not vegan but I am dairy, gluten and nightshade free. This recipe is right up my alley by just changing out those delicious looking potatoes with sweet potatoes or yams! But tell me…do you eat the skins of the squash?!? Can’t wait to try this, yum! Hi Linda! I’m so glad this recipe will work for you, mashed sweet potatoes would be lovely here! I don’t eat the skin of the squash, it’s just much easier to remove it one it’s cooked! Wondered the same thing. So glad you asked this question. Yay! Thanks for commenting Sarah, I’m so glad you enjoyed it! This is what’s for dinner! Yum. Thank you. This looks amazin! Can’t wait to try it! Do you peel the potatoes? Thanks so much Karine! I don’t peel the potatoes but it depends what kind of potatoes you’re using and what your preference is! I didn’t peel mine because I was using Creamer potatoes which are the same size as baby potatoes and their skins are thin and tender (and I don’t mind most varieties of potato skins!) If you prefer skinless mashed potatoes you can peel them! This was my first vegan Thanksgiving and I was so surprised by how good it was! I made everything exactly as written and wouldn’t change a thing! Thank you so much for posting this. Made my holiday so much easier. Leftovers were just as tasty! Will make it for Christmas too! Looks absolutely beautiful and healthful…will make this on Thanksgiving. Thank you! This was so good made it tonight. Followed instructions except for potatoes made my own with vegan butter and Ripple half and half. This will be on my menu on Thanksgiving. Thanks for commenting Janet! I’m so glad you enjoyed this recipe. I wish I could buy Ripple in my area, it’s SO good! Haha! Thank you so much for commenting, I really appreciate it! It was absolutely delicious. My new go-to meal. Yay! I’m so glad. Thanks for commenting!